Wow! I reached 186 followers!! How did that happen??!?! Welcome to my new followers!! After this post I will go and follow you, and if you don't have your blog linked to your profile, then I won't be able to!! So make sure that you go to edit profile (which is in your Dashboard) and click on "select blogs to display" which is highlighted in blue and then enter your blog! Voila! Now I can find you and your blog!!! Okay, so lots of things to report! First off, my Tusal jar. I'm a day late but that's okay. Better late than never. I'm so tickled pink that I've been voted for a Leibster award 4 times!!! Rhona, Ewa, Rowyn and Julie gave me the award. So a big thank you to you ladies!!! You should check out their blogs. They are all such lovely ladies who have very unique and wonderful blogs!! Okay, so the first one, I can't do!! It seems almost every blog I have has been awarded the award, even more than once!!! I've linked back to my original award givers above the picture of the award. So that leaves me with the 5 random facts. The fun bit. Or maybe for others....I feel I don't have loads of interesting facts about me! Or rather nothing that pops up in my mind! 1. When I was 15/16 years old, I was obsessed with U2, specifically Bono. Had loads of his pictures covering my locker door. I know ALL their music and lyrics up to their Zooropa album. Then they just started to go too mainstream and boring for me. 2. I taught myself how to play piano and guitar but learned how to read music in high school band. I played the oboe in band. I think learning the music destroyed my natural talent to play by ear. Now I rely on the notes to play piano...but I haven't learned how to read music for guitar, so I'm okay with picking out a tune! 3. I'm obsessed with Russian authors and have read almost all the greats. Currently working on War and Peace by Tolstoy and I have read 55% of the book!! I started in January...it's taking a LONG time! 4. I pierced my belly button at age 16 on my own at my friend's house while we were listening to the Velvet Underground (I'll spare you the song as it is shocking and even though it's a good song, the content isn't). I fainted. It didn't hurt and the piercing didn't last. I have a small scar to prove it! 5. When I first met my husband, I thought he was French. He isn't. It was just really loud in the night club and I had a hard time hearing him speak with the loud music booming in the background! He thinks his French is great, but it isn't!!! There! I could've chosen other info, but that's what popped into my mind at this moment! Thanks again ladies for the award!!! I had something else to share with you....what was it....hmm, the song "Sunday Bloody Sunday" is going round my head right now..oh ya! 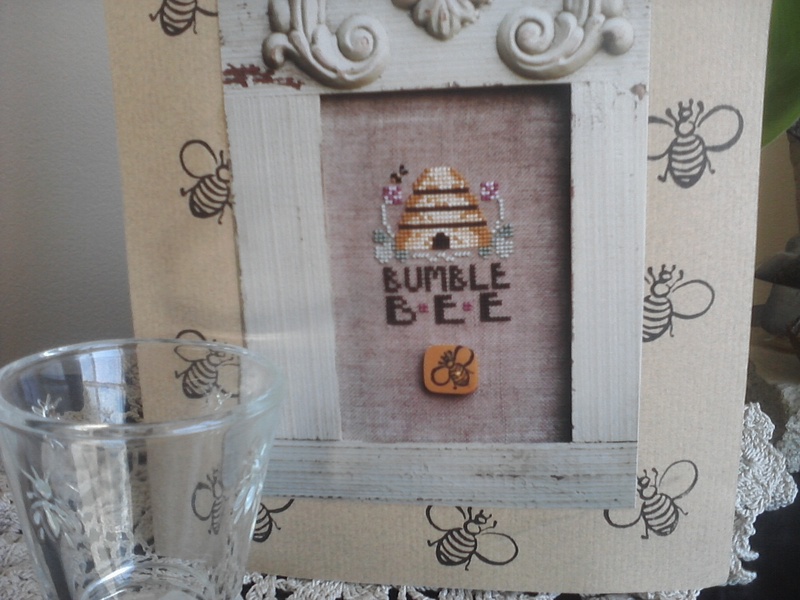 Rahenna's Bee chart arrived in the mail today!! It's so cute! Thanks again Rahenna!! Such a cute design!! 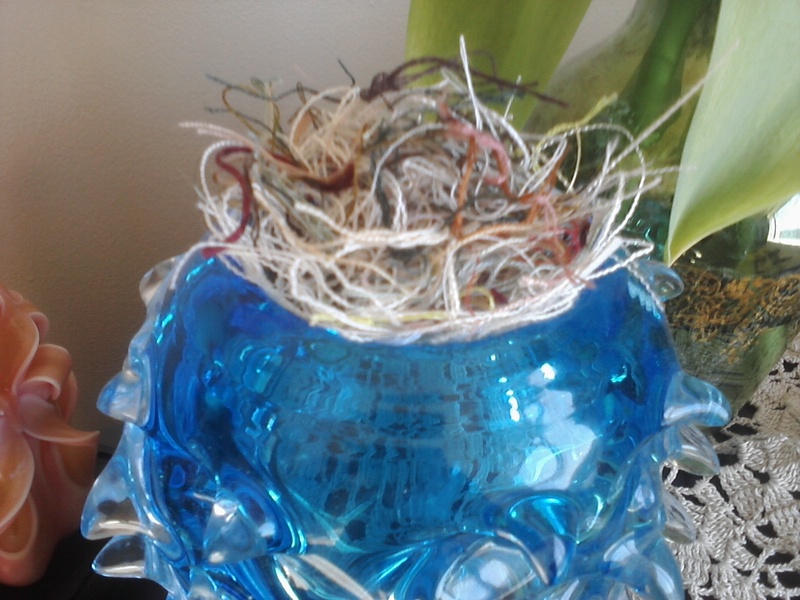 I'm going to have to do some digging and find a good scrap of linen for this little guy!! Last bit of news. So, one of my RAK's arrived!! I'm so happy that Lynn from Kearnel's Korner was pleased as punch to receive my little spring pillow!! 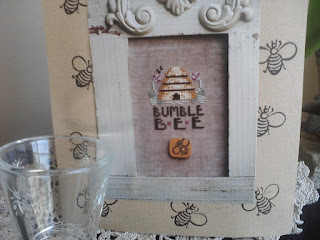 She took some adorable photos of the pillow with her bee can! I love her kitty too! She's just like Titus!!! I had a lot of fun putting this together and the second Rak will go out today (hopefully if I make it to the post in time!). I will be doing more in the future! Here's my photo of the pillow I made for her. Mine isn't as good as hers though!! 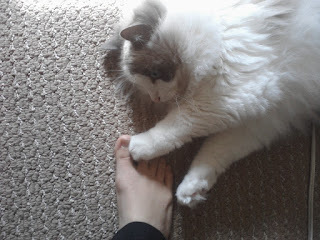 Oh, and here's Titus lovingly touching my toe! He loves feet for whatever reason and licks them too! He's such a dog in so many ways! I think that's all! I feel like I'm forgetting something. Congratulations on your award. I enjoyed your list of random facts. 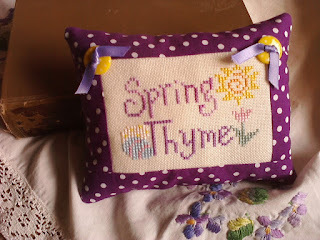 I love your Spring Thyme finish, it's very cute. The bee chart is lovely too. 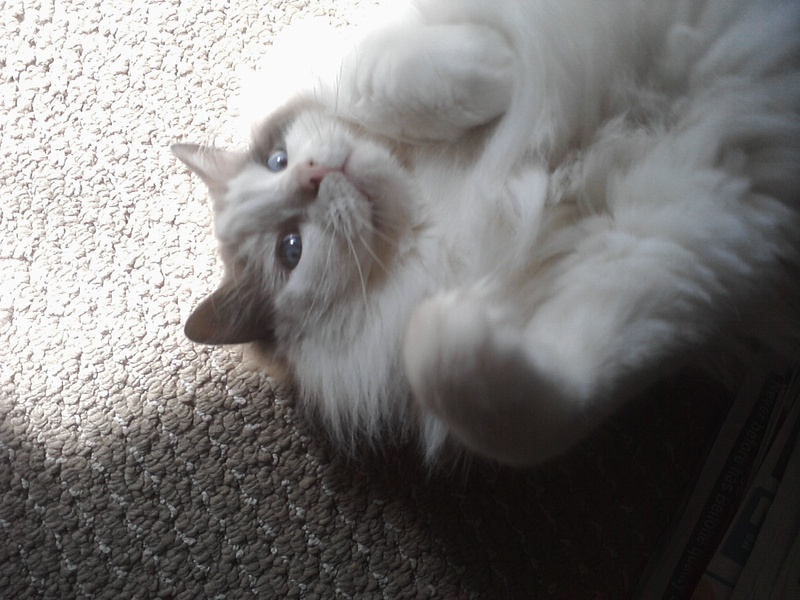 A great picture of Titus - Hope he doesn't dig his claws in! Congrats on the award! Great....now I have Sunday Bloody Sunday in my head! Love the RAK that you sent...you're finishing is fantastic! And that Titus...always hamming it up for the camera! Happy weekend! LOVE THE LITTLE CUSHION... SO ADORABLE! Congrats, Anne, on your award and your quickly growing group of followers! And thanks for sharing all those interesting facts about you! I will tease you more when I see you in person! Congrats on the award and the followers! I looooove U2! I discovered them late in life though. lol! I'm only a year younger than Bono himself, so you get the idea. Love Russian novels too! But we already had that discussion, I think. Great RAK! And of course cute Titus! lol -- I do think some cats are a bit like dogs in some ways! Congrats on the award(s)! I found the random facts the hardest thing!I hope you manage to get through War and Peace,I've always wanted to say that I have read the book but have never managed to get as far as you have....one day, maybe! Congratulation on the award and for sharing the info...I have been a U2 fan for so long...I have all their music! I really enjoyed reading your five fun facts, Anne, and congratulations on your award--you deserve it :) Love it that you're reading all those mammoth Russian novels! 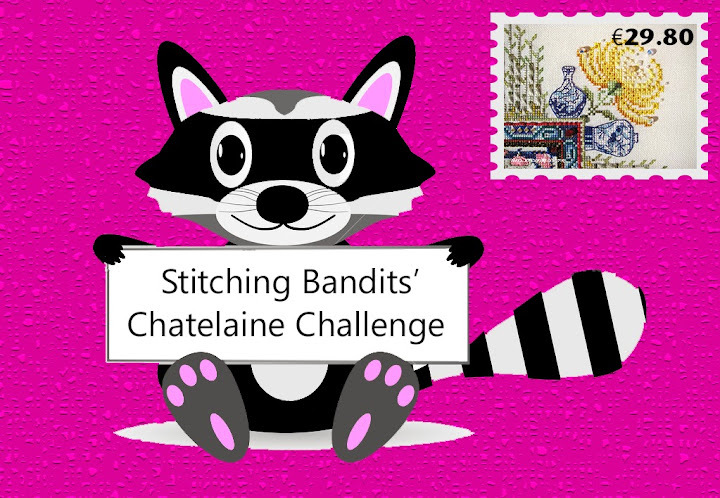 Your RAK to Lynn is adorable and you couldn't have picked a sweeter person to send it too! Funny story: When my sister was in Ireland, she went out for a walk. On her walk she found this beautiful big gate and decided to sit down and have her lunch there. After a little while, two men in suits came out and asked her to leave stating that she was a "threat to Mr. Bono's safety." She had unwittingly sat down in front of BONO'S HOUSE to have her lunch, and they had deemed her a threat. Nice, huh? Out ogling ORTs. Yours overfloweth! LOL What a funny cat. Give me shivers to think about toe-licking. I'm too ticklish! Oh Anne! I too just received the Liebster award and I had to laugh. I thought about sharing the fact that also at age 16, I went into the bathroom with my mother's largest sewing needle and a potato. She would not let me get my ears double pierced. So I did it my self. It took forever to get it done. She said,"What's going on in there?" Well, she found out when I emerged finally. AMAZINGLY I was not grounded. She was too stunned I think. Love the RAK you stitched for Lynn. It's so pretty. I am loving the Liebster award updates. The sweet RAK you sent off is lovely. Perfect for this time of year. Congrats on 187 Followers. I love reading about your random facts :) Saw the pillow on Lynn's blog. Gotta tell you it's so cute. Titus is just adorable. I think you should have to come up with twenty facts about yourself, Anne. (Hey, no throwing things!!!) Glad to hear your five things. And grats on the chart, and I love your little pillow. It's cute!! Titus is adorable, of course. Yes Dear says Hi (and sends hisses. She doesn't like other animals, lol). First of all congratulations on your award! How wonderful! Wow look that ort jar overfloweth! What a lovely gift for Lynn she is such a great person! I'm woefully behind in my blog reading and wanted to tell you how much I've enjoyed the pics of your WIP. I love my pillow and have it displayed on the dry sink in my living room. Clarisse tries to get up there and sneak a sniff of it every chance she gets! Must be the scent of Titus that gets her going! I love your pics of him, btw. He's such a handsome fellow! Congrats on your Liebster award! What fun facts! Congrats on the awards and the folllowers, that's great! Lovely rak piece too ~ so very cute! I fainted at #4 btw.... no one is allowed near my belly button. Just thinking about it right now is making me crazy. LOL!! 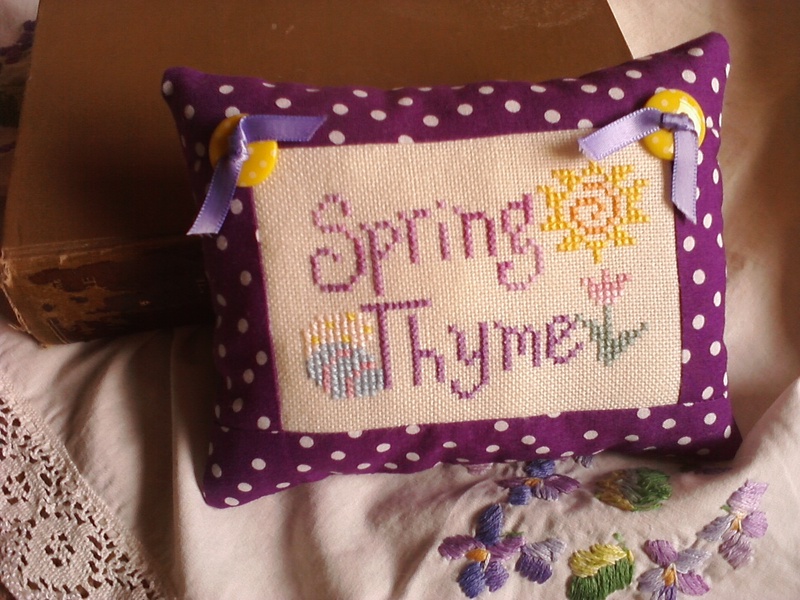 LOVE Spring Thyme. You've outdone yourself, Girlfriend! !